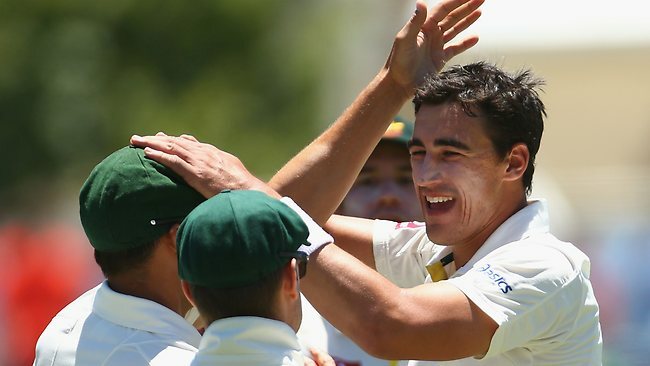 Having bowled out for 225 on the opening day of the third and final test between SA and Australia, SA bowlers were quick to settle the score and bowl out the opposition for 163 to take 67 run lead. Resuming at play at 33 for fall of 2 wickets, Warner and night watchman Lyon were unable to give hosts a good start. First, Warner fell to Steyn to bring in Ponting to the crease and later, Lyon fell shortly to him. Philander took the wicket of Ponting. The only decent resistance from Australians was shown by Matthew Wade. Dale Steyn was the most successful bowler taking 4 Australian wickets that also included the wicket of in form Michael Clarke. SA start to the second innings was a bit nervous. Soon after tea, Alviro Peterson was out by a classic ca particular, but all 10 wickets remained intact when tea was called. Alviro Petersen would be lost shortly after the resumption when he popped up a botch by Johnson. That brought in the in form Amla at the crease. He and Smith had a partnership of 177 runs to take control of the match. Amla is not out at 99. Smith was out at 84 and deserved a century but a missed hook gave a chance to Nathan Lyon who made a stunning catch. The third day is going to be make or break for the Australians as SA already has a lead of 197 runs.